If you find yourself dealing with one of these issues, there are a few possible workarounds that may prove useful. The first approach is to strike a tire from the vertical position. There will be no need for a large tire with such an approach. The floor will also be safe, as the top half of the tire will absorb the force of the sledge. In the pictures below, you can see this simple contraption. The tire is secured with cable, which is wrapped around a piece of backerboard. 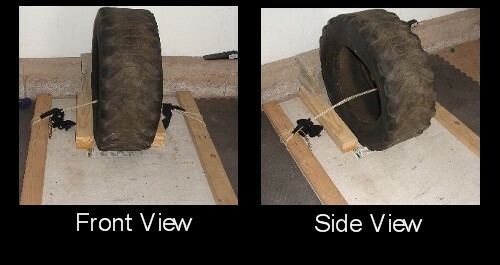 2×4″ strips are screwed to the backerboard, on each side of the tire to prevent lateral movement (please note that the 2×4’s seen along the perimeter of the backerboard are not needed for this device). Within the video clip below, you can see how well this tire absorbs impact from a 16 pound sledgehammer. We can swing away without damaging the floor, and without worrying about the tire sliding. Another vertical tire option that I’ve seen involves burying half of the tire in the ground. You would then strike the exposed rubber. This option may not be landscaper friendly however, and certainly will not score you any points with the neighbors. Another option would be an outdoor sandpit. If you have the room for it, a sandpit can be used to absorb strikes from the sledgehammer. Flying sand may get messy however. Therefore, if at all possible, I suggest using a tire. As seen above, you do not need a monster sized tractor tire to get the job done. 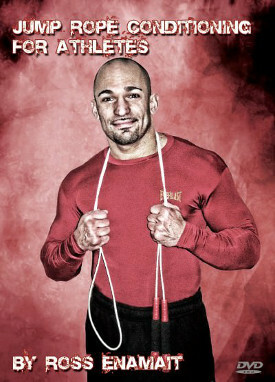 With a few minutes of work, you can rig up a very durable striking device that will fit in the corner of your gym.